Misty Knight: Are you a sorcerer? Loki: The only one that matters. Misty Knight: Can you get me out of here? Loki: Can you convince me why I should? For all I know, you're some foul demoness poised to devour my eyeballs at the first opportunity. Misty Knight: I'm the only one who knows what's going on with Mephisto. And if you don't get me out of here right now, I'll leave your eyeballs for last so you can watch the beating I put on you. Loki: What do they call you? Loki: We're heroic partners now, Foggy Evening. Tell me everything you know about Mephisto. 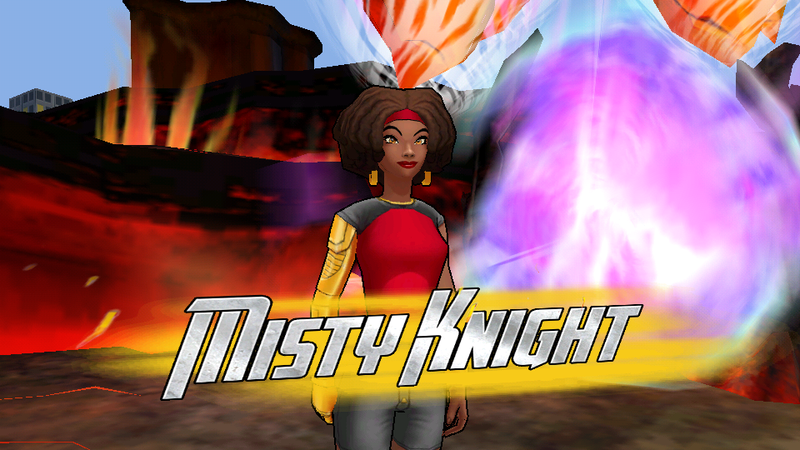 Misty Knight: He's a demon from another dimension bent on taking over this one. Seems like a lot of his powers are based around tricking people, and manipulating their emotions. Misty Knight: Thanks. Some super-scientist made it for me. What was his name again? Really smart, handsome guy. Peter Parker? Or maybe it was T'Challa? Iron Man: See, just having one of my inventions attached to you immediately improved your sense of humor. 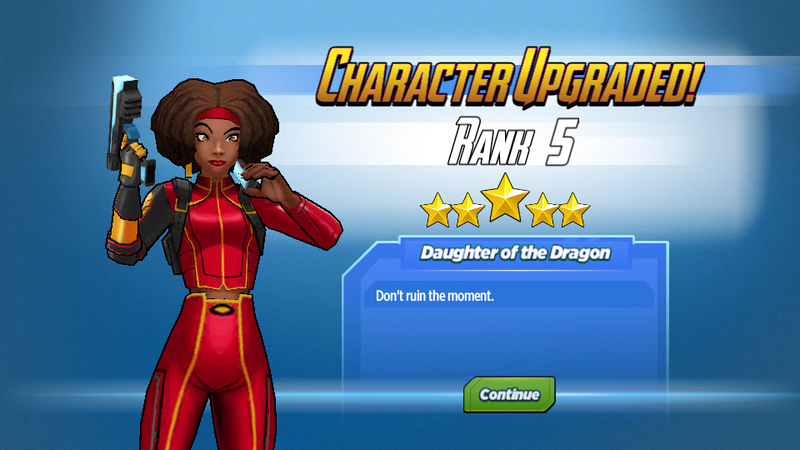 Misty Knight: Seriously though, thanks again, Tony. I'll never be able to pay you back for this bionic arm. It's saved my life more than a few times, and now it's gonna help us save the world from Mephisto. Iron Man: C'mon! That's a solid Super Hero one-liner! 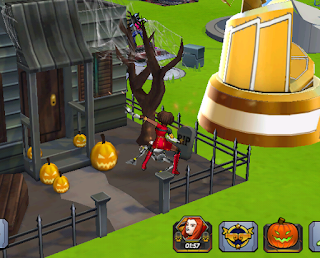 Note: She must be completely unlocked by the end of the event or she will disappear from the game at that time. Iron Fist: I'm so glad you're here. Misty Knight: Would've been even nicer if my boyfriend was the one to save me. Iron Fist: You know I would have. I was in an interdimensional fighting tournament in K'un Lun. Misty Knight: I think you love your interdimensional fighting tournaments more than me. Iron Fist: No way! I mean, I fought a guy who creates light-cancelling darkness fields, so I'm not gonna say it wasn't totally awesome, but you know I'd always rather be with you. Misty Knight: I'm just giving you a hard time, Danny. Let's kiss, so we can go punch some demons. Black Widow: We should start at the Archives. There's probably some lore that details his history and weaknesses. 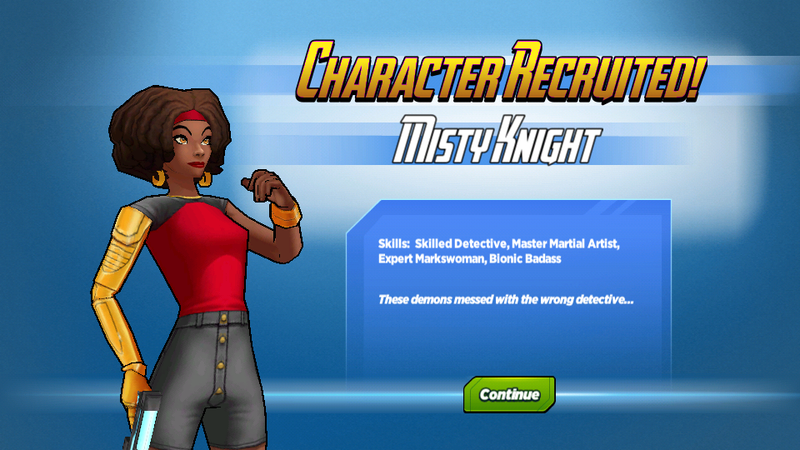 Misty Knight: Sounds good. I need to punch something first. Make sure this arm didn't get messed up in Hell. Misty Knight: Still works like a champ. I should send Tony something for his birthday. Black Widow: His inventions are great. Don't tell him I said that. I'll never hear the end of it. Black Widow: You have a plan, right? Misty Knight: I did. Then I, you know, got trapped in Hell. Misty Knight: Why do you guys have so many books about summoning demons? Black Widow: I blame Enchantress. For everything. Misty Knight: I don't use this ability that much. Always kind of weirds me out. But I can't think of a better way to fight Fire Demons. Black Widow: Don't you wanna practice first? Loki: Only a Midgardian would waste ice powers on entertaining vermin. Misty Knight: Are you trying to say your ice powers are better than mine? Loki: There can be only one! Luke Cage: Danny said you're back. I thought you had your own agency now! Where's your partner? 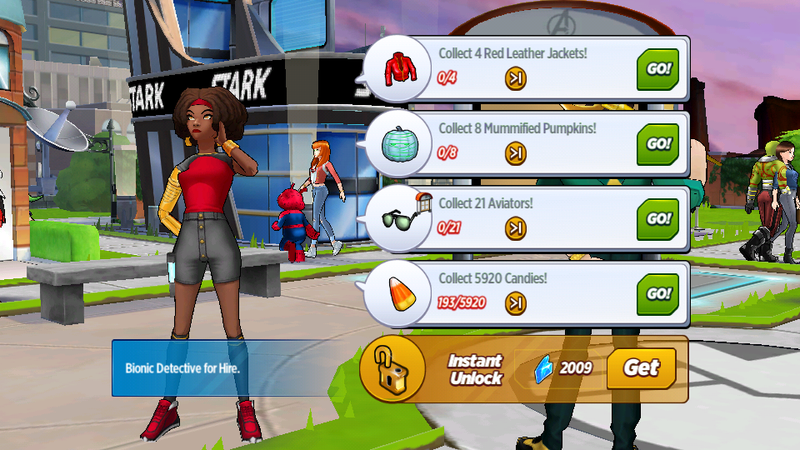 Misty Knight: She's busy. We aren't all workaholics. I mean, I am, but that's not the point. Luke Cage: Need any help? Investigating isn't really my thing but I could probably persuade Jess to take a look. Misty Knight: Looks like pretty much everybody who learns anything about Mephisto ends up missing. Black Widow: He must have some earthly connections. Everyone does. Why else would he be here? Black Widow: Everyone has a weakness. 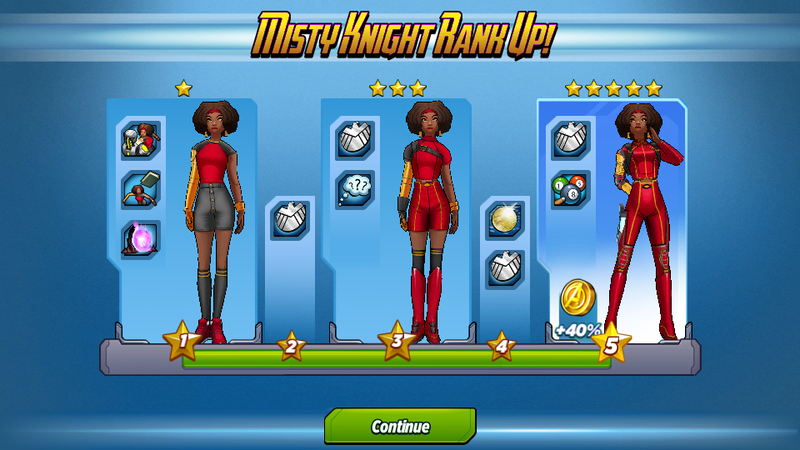 Misty Knight: Everyone but us. Iron Fist: Take a break, babe. Chill. Clear your mind. Open your spirit to the possibilities. 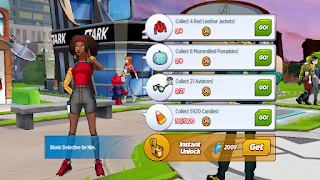 Misty Knight: Chilling is your answer to everything. Misty Knight: I've been trying to find out why Mephisto is doing this, but motives are only useful if there's a hope of changing his mind. Iron Fist: I don't get it. Misty Knight: I should be looking at the "ho". How he does the thing is how we stop him from doing the thing! Iron Fist: I'm so glad you're the brains of the operation. Misty Knight: I miss Colleen. I know she's busy, but my girl is out there all alone. Iron Fist: And she's the toughest ninja I've ever met. You don't have to worry. Misty Knight: I'm not worried about her getting hurt. I'm worried about her getting herself arrested, and us not having bail money. Misty Knight: I called Colleen. Iron Fist: Awesome. All that stress is bad energy. Now you can chill. Misty Knight: She said to punch Mephisto where the sun doesn't shine or she'll do it for me. Iron Fist: ...Are you okay? Misty Knight: I was hoping you could help me solve this. Jessica Jones: That's what I'm here for. Misty Knight: I know you usually work alone, but I miss my crew. Who do I bounce ideas off if I'm the only one actually investigating? Jessica Jones: I just talk to myself, and hit people. Misty Knight: That was the worst lead yet. 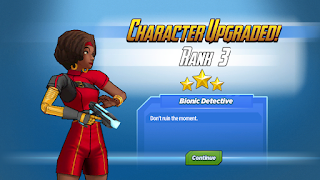 Misty Knight: I can't catch a break, can I? Jessica Jones: Don't beat yourself up. Iron Man: I used my awesome genius to build you that awesome arm so you could do awesome Super Hero stuff. Misty Knight: Enough of this sulky, introspective crap. It's about time I busted this case wide open. Iron Fist: Yeah it is! 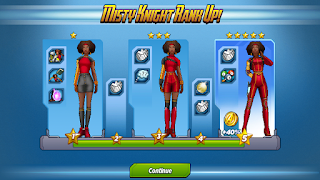 Misty Knight: Second-guessing myself won't get me anywhere. Iron Fist: Yeah it won't! Misty Knight: Not everyone here is ignoring the Mephisto thing. They can help. 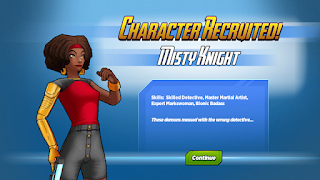 What do you think of Misty Knight? Have you unlocked her yet? If not, are you close?